Amin Nasser, Chief Executive Officer of Saudi Aramco, whose shareholder is a sovereign nation, weighed in this week with a warning against U.S. and European activist shareholders who are making demands of the world’s largest publicly traded oil companies. Nasser told an industry audience in London that the oil industry faces a “crisis of perception” among its stakeholders that puts at risk its ability to supply energy to billions of customers around the world. In a speech to International Petroleum Week in London Tuesday, Nasser outlined “urgent, collective effort” the oil industry must take to counter the perceptions crisis. Such steps would include pushing back on narratives that oil is a bad financial investment because demand might peak soon and offering the development of cleaner fuels that respond to consumer concerns about environmental, social, and governance issues. The speech comes on the heels of an active proxy season in the United States and Europe where shareholders of the largest oil companies, whose stocks are publicly traded, have asked the firms for transparent reporting on how they will reduce the carbon footprint of their products and operations in line with the 2 degrees Celsius Paris climate accord goals, including setting concrete short, medium and long term targets for reductions. ExxonMobil has formally asked the U.S. regulatory agency, the Securities and Exchange Commission (SEC), to reject the shareholders efforts to bring the resolution to a vote at ExxonMobil’s annual meeting in May. Royal Dutch Shell has already adjusted its strategies to reflect similar requests and will link future executive pay to emissions reductions achievements. The company announced recently that it was buying German residential solar battery maker Sonnen and investing in electric vehicle charging stations in Europe in addition to its hydrogen fuel business in Germany. BP is also moving into the EV charging business, and has agreed to demonstrate how its business will align with Paris climate goals including executive remuneration based on emissions reductions. Chevron’s shareholders are asking for information on the company’s strategic vision and response to climate change risks and opportunities. Goldman Sachs is under pressure from activists this year to reduce the carbon footprint of its loan and investment portfolios. France’s Total whose stock performance has outpaced others in the last year, tweeted today that “It’s not about putting a green paint on @Total’s logo but a real evolution of our energy mix”, projecting that the company will hit 10 to 20 percent low carbon electricity by 2040 on top of 45 to 55 percent natural gas, leaving liquid fuels (oil and biofuels) at only about a third of the company’s product mix by 2040. The oil industry has trendlines to point to in its narrative that oil is hard to move away from. Global oil use climbed 1.3 million barrels a day in 2018, according to the International Energy Agency, amid stronger oil use in China and India. IEA projects similar growth for 2019. China’s oil use rose by 440,000 b/d last year, despite a 17 percent decline in car purchases. More surprising was higher U.S. oil use, which topped 540,000 b/d in growth last year as the American economy expanded. New academic studies reveal that economic expansion is once again linking to a rise in U.S. vehicle miles traveled (VMT) since 2012, dispelling the notion that millennials might drive less. U.S. Federal Reserve Bank economists are finding that millennials have the same consumption preferences as past generations, including interest in buying cars, but are less well off than members of previous generations. Some U.S. cities are also finding that use of ride hailing services can potentially increase VMT, rather than lowering it. These latest trends suggest that wild predictions that global oil demand would peak by 2020 will likely be off the mark. Still, the possibility that oil demand will plateau or even decline in the long run cannot be dismissed out of hand. That’s because in multiple sectors – across vehicles, manufacturing, freight and even plastics – digital technologies are transforming the way things are made, shipped and used, with large disruptions to current use patterns possible. Last summer, Citi published a report suggesting countries across the globe are beginning to strengthen restrictions on single use plastics, noting that China’s decision to stop imports of plastic waste last year. “With China no longer importing plastic waste and other countries unable to absorb the high level of supply, exporters will likely be forced to expand on domestic recycling infrastructure and/or cut back on the level of waste being produced,” Citi noted in its report. McKinsey & Co. estimates that recycling and substitution of biomaterials could shave 2.5 million b/d off rising oil demand for plastics manufacturing by 2035 and that 60 percent of plastics used by 2050 could come from production based on previously used plastic. Changes in global trade and freight practices could also substantially lower oil use in the future. In its “Less Globalization” scenario, BP projects that the rise in global economic expansion would lag about 6 percent, compared with a business as usual projection for 2040, translating into about a 2 percent loss of oil demand, if tariff wars and rising populism were to continue to dent global trade. That estimate for a minimal effect on oil use could prove optimistic, since next generation manufacturing technologies, increased use of optimization programs for logistics, increased use of alternative fuels in trucks and delivery vehicles and rising protectionism for jobs could mean bring much larger changes in oil use for aviation, shipping and on-road freight. Our modeling, in partnership with University of California Davis researchers, indicates that there are still many policy levers that could change the trajectory for oil use in transportation. We found, for example, that the possibility that proposed bans on new sales of internal combustion engine cars by 2040, mooted in Europe and even discussed in China and India, could shave 5 million b/d from future oil demand, if implemented broadly. 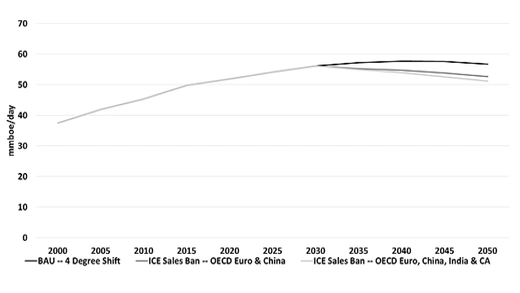 In one scenario, utilizing the International Energy Agency’s mobility model, we defined the parameters of an internal combustion engine (ICE) sales ban policy as one where non-plugin, ICE-powered new vehicle sales go to zero in Europe, China, India and California by 2040. Plug-in hybrids are assumed to be exempt from the sales ban, as well as commercial freight vehicles, emergency vehicles, and 2/3 wheelers. Closing geo-fenced areas of major global cities to gasoline-powered cars, potentially in favor of electric vehicle ride sharing or greater use of public transit, could double this effect, our research concludes. New policies that promote use of alternative fuels for buses and in on-road trucking, a policy already underway in China, would also curb growth in oil use significantly. The bottom line is that a combination of rapid technological disruption and shifting geopolitics has the potential to adjust the trajectory for oil demand, potentially downwards, but also, without strong policy intervention, possibly upwards. That is creating great uncertainty for investment in the oil sector. Historically, investors have favored oil company shares and oil commodity financial derivatives because they felt that the sector would face future scarcity of both produced supplies and physical reserves. This view of peak oil supply propelled billions of dollars in capital investment in search of new reserves. Oil company reserve replacement was highly valued and rewarded. Now this presumption that oil demand could only flow one way – upward – is more uncertain and notions of long run oil scarcity look more doubtful as the industry unlocks the technical ability to produce more oil and gas from “source” rock, rather than from large already discovered reservoirs. These two new realities are not fantastical “perceptions.” They are the outcome of new uncertainties created by rapidly accelerating changes in technology. As shareholders pressure international oil companies (IOCs), they are increasingly positioning themselves to respond. A recent Wood Mackensie consultants report suggests that renewables could represent one fifth of total capital allocation for the major oil companies most active in the alternatives sector after 2030. That should be a cautionary note for national oil companies (NOCs) thinking that the oil majors can be the financing backup plan if their own attempts to expand (or possibly just to maintain) oil production capacity fail in the next few years. Increasingly, the majors will judge possible long-range mega-projects with a tougher eye, now that booking large reserves is not currently rewarded as it once was by Wall Street. That could create future difficulties for countries like Venezuela that are counting on foreign direct investment to bail it out of mismanagement of its oil sector. Thus, Mr. Nasser may be correct. Oil supply could prove volatile in the coming years (or even in the next few months) as national oil companies face increasing problems. But that problem won’t likely be tied to misperceptions by the shareholders of the IOCs. It is more likely to be related to how Saudi Aramco and its peers manage their current revenues and future investments.